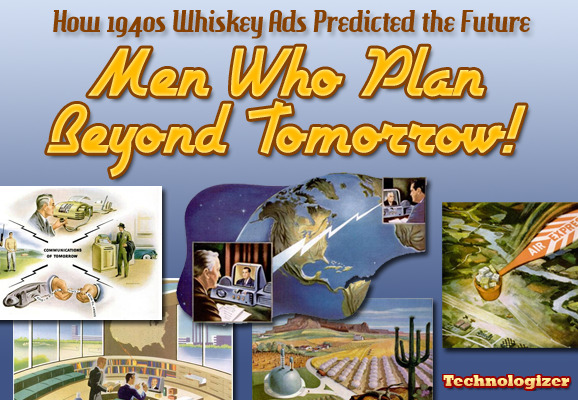 Back in the mid-1940s, Seagram's advertised its VO Canadian whiskey with a series of extremely manly magazine ads about "Men Who Plan Beyond Tomorrow" -- unspecified futuristic thinkers who liked the fact that Seagram's was patient enough to age VO for six years. No, it doesn't make much sense to me, either. 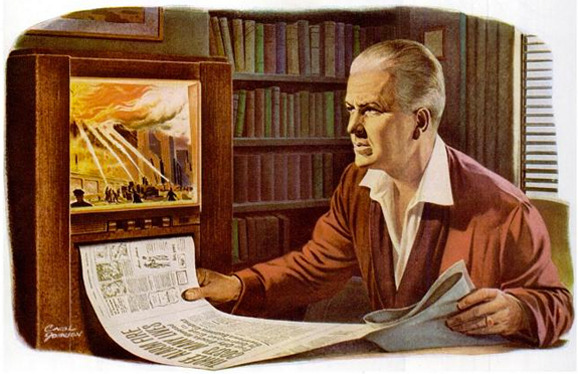 But the ads, each of which depicted a different miracle that would transform postwar America, are glorious. They're entertaining when they sort-of-accurately predict scenarios that eventually came to be, such as the rise of the cell phone. And they're even more so when they marvel at wonders-to-be such as coin-operated streetcorner fax machines. Herewith, some highlights as they appeared in LIFE magazine -- click the dates to see the issues with the ads at Google Books. 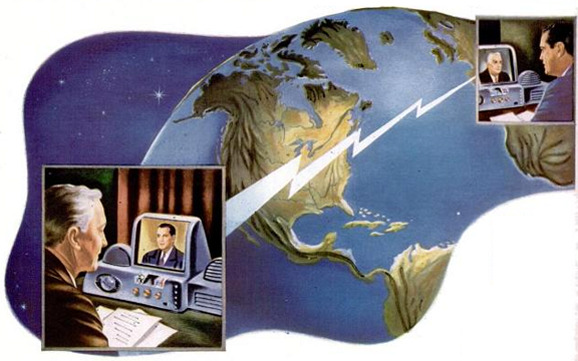 "Perfected television and radio telephone combined!" This is supposedly a Chicago businessman using a videoconferencing system (with color screen, yet) to talk to his rep in London. But I could swear that the art shows Richard M. Nixon conspiring with J. Edgar Hoover. It's pretty much like Skype, except for the fact that the 1940s conferencing gadgets are way neater looking than any modern PC. 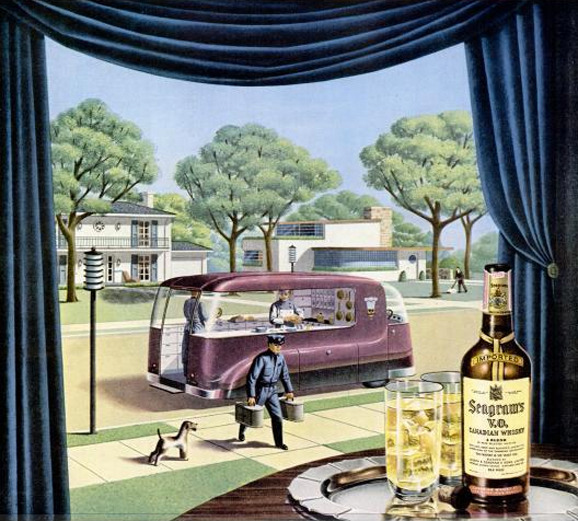 Nine years before the first 3D movie boom and forty-six years before Avatar, Seagram's told whiskey drinkers that they'd go to 3D movies "more thrilling than any you ever dreamed of!" This being 1943, the movie shown involves fighter jets soaring above the audience and soldiers stomping right through it. I believe that the person to the left dressed like Flash Gordon is an usher, not part of the spectacle...but you never know. 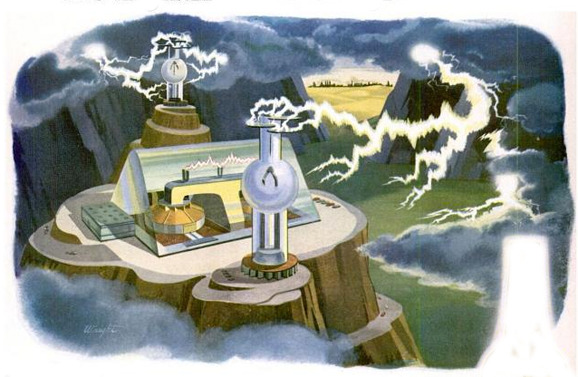 In the future, "giant vacuum tubes will harness the virtually boundless energy of electrical storms...transmitting it to storage plants that will furnish fantastically cheap power to industries and whole cities." And making your local power plant look a little like it was designed by Dr. Frankenstein. 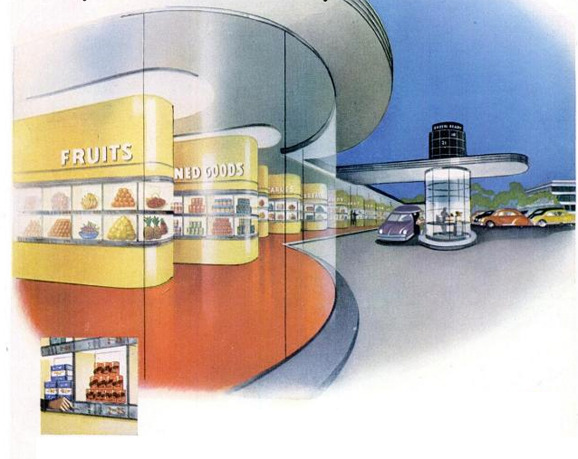 One of the amazing mobile supermarkets which Seagram's said would "rush fresh foods to the housewife's door!" by making scheduled stops on every block. It's pretty much like Webvan, except you can squeeze the cantaloupe for yourself. Note that these ads were so masculine that no housewives are depicted here. 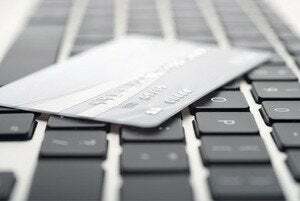 "Today's weapon, tomorrow's convenience!" 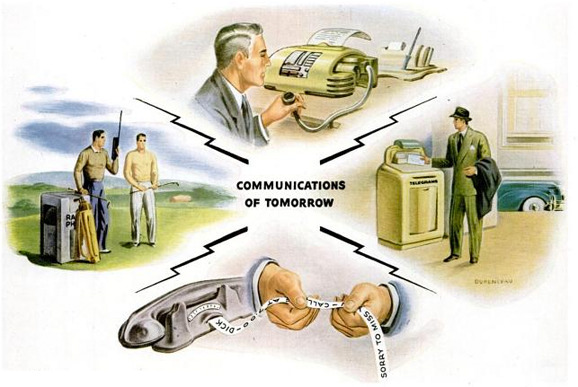 Seagram's explained that the wireless phone was already in use by the armed forces, and would soon become a consumer product; it ended up taking fifty years before cell phones became truly common. 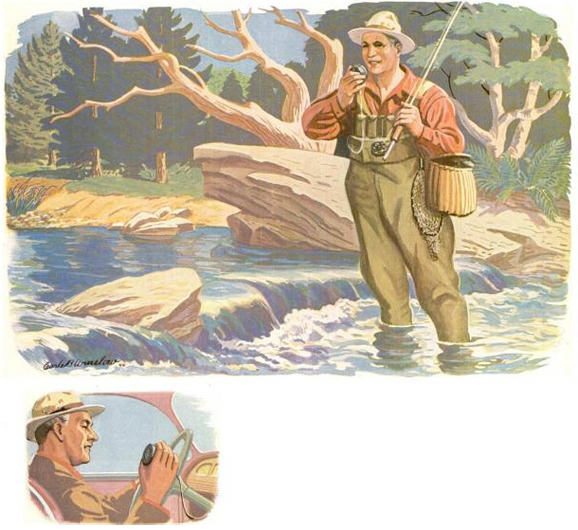 In this demonstration, a fisherman phones his wife to relay good news about his catch and ask her to invite the neighbors for dinner, and then calls her again from his car to tell her what time to expect him. He's using a pocketwatch-like handset on a cord, and I'm not entirely sure where the phone is. "Fantastic? It's already planned for post-war use!" This TV has a built-in fax machine that spits out a newspaper with coverage of the events you watch on-screen. I can't quite tell if the paper is astonishingly up-to-the-minute, or the TV report isn't a live broadcast, or if the fire has been going on for hours. In any case, the fellow here seems distressed by it all. Maybe he needs a good stiff drink. 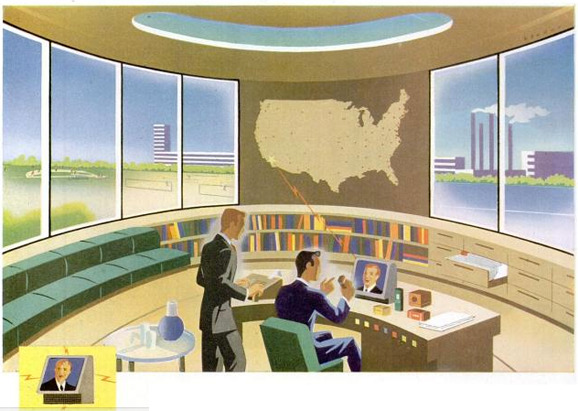 In Seagram's futuristic workplace, there's a videoconferencing box on every desk, and assistants helpfully visualize essential business data on giant screens. All the while, distant smokestacks gracefully pump toxic fumes into the atmosphere. The ad makes reference to records which "appear as if by magic" from automatic files; I think it's referring to robotic filing cabinets, not hard disks. I'm also intrigued by the several unmentioned gizmos on the desk-maybe they include a proto-iPod, a rudimentary Flip, and a pseudo-BlackBerry. Part drive-in, part automat, this supermarket lets you choose grocery items from showcases with a special key. 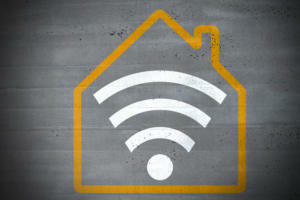 When you use the key, a signal is sent to a basement stockroom to add the item to your order, which is delivered to your car when you're finished shopping. I like the fact that all the cars shown in all these paintings are 1940s models -- they thought this stuff was just a few years away. 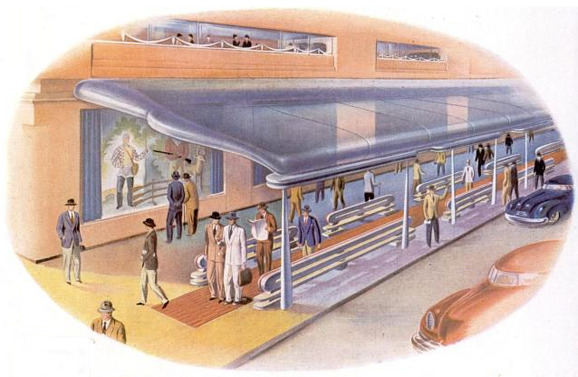 Pedestrians of tomorrow -- all of who will apparently be men in hats -- will rejoice when cities build moving walkways, cool them with hidden pipes, and cover them with transparent canopies. 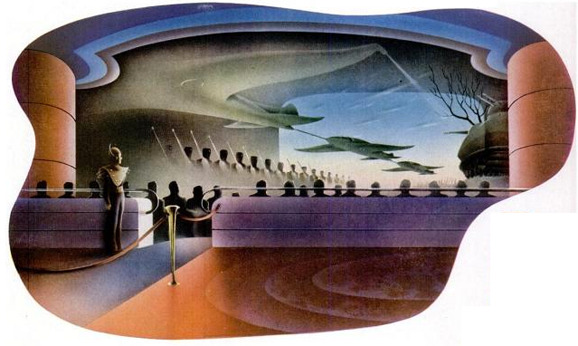 This reminds me of (A) The Jetsons; and (B) Las Vegas. 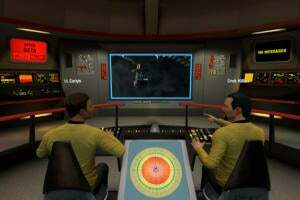 From left, clockwise: A golfer uses a mobile phone that looks uncannily like an early Motorola brick, a businessman dictates into his auto-voice-recognition-printer, a road warrior takes advantage of a street-corner fax machine, and someone checks a message courtesy of the answering feature built into his phone. Not all of this came true, but some of it did. Come to think of it, speech-to-text voicemail conversion is one of Google Voice's killer features, and it only took sixty-three years for it to get here. 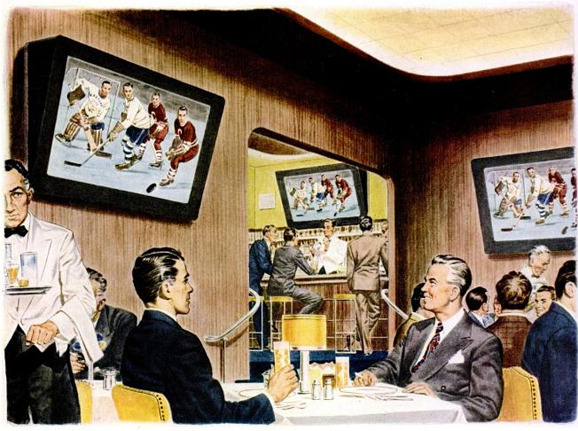 This one's pretty uncanny -- Seagram's predicted the rise of the sports bar, down to the fact that they'd eventually be festooned with giant flat-screen TVs. For understandable reasons, however, the distiller mistakenly believed that said bars would be filled with natty proto-Mad Men sipping whiskey, not drunken louts swilling beer. I can't explain, however, why they're all watching hockey. 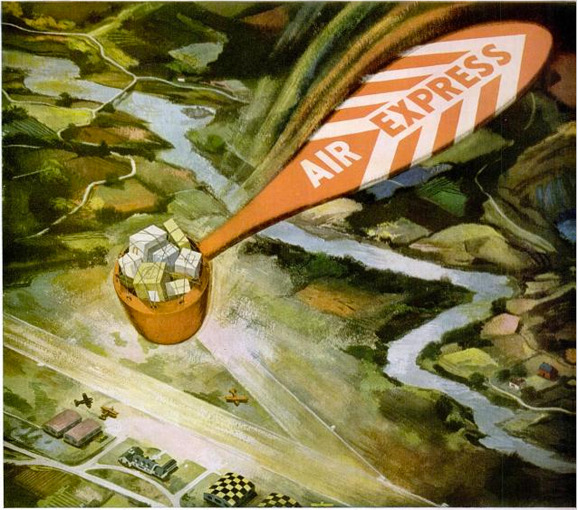 Free idea for Fedex: Expedite air shipments by dropping shipments from planes in whirligigs with cushioned rubber compartments for packages. You gotta think that these would occasionally go astray and crush random passers-by. Even so, it might be worth it. 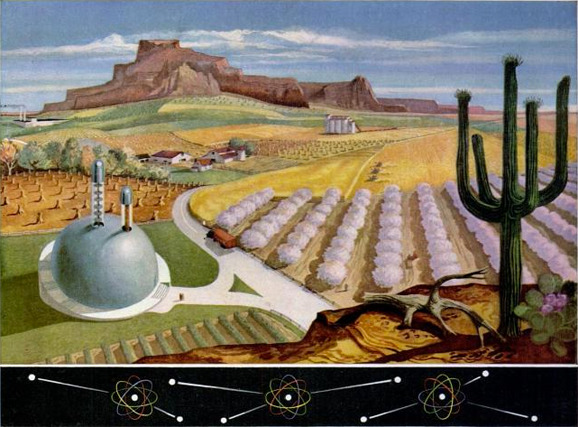 In the future as envisioned by Seagram's, atomic power will somehow make it possibly to build bountiful farms in the desert. I believe that the things in this painting that look like dozens of tiny mushroom clouds are actually plants. At least I hope they are. 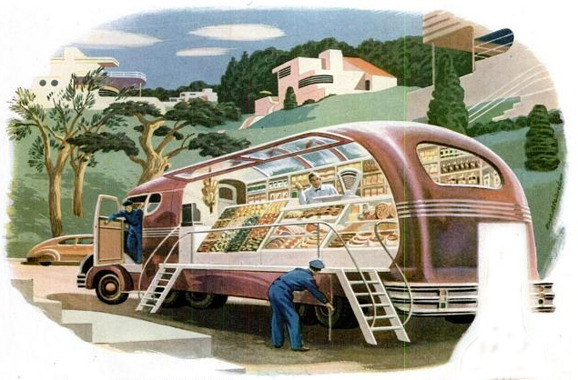 Here we have a van that delivers piping-hot gourmet meals to Americans who live in "compact, servantless homes" -- and yes, the chow is prepared by chefs onboard the vehicle as it zips around the neighborhood. (The customer has two highballs made with Seagram's VO all ready.) As far as I know, nobody has actually implemented this idea to date. 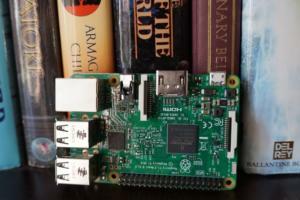 But if you did, I bet you could find some venture capitalists who'd pony up some cash to make it happen . . .